Q. 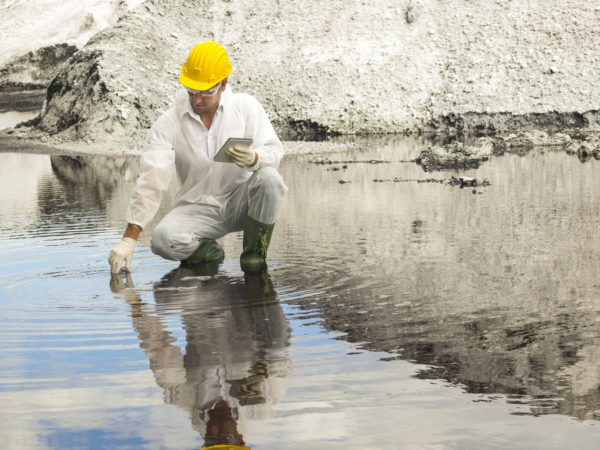 What cleaner can water labs use when they work in the ppb or ppt for heavy metals analysis? A. Liquinox® Critical Cleaning Liquid Detergent is suitable for use in cleaning laboratory glassware for heavy metal analysis in the part per trillion (ppt) range. Note that undiluted Liqunox detergent contains less than 10 ppm of any heavy metal. When used at the recommended 1% dilution, assuming no contribution of heavy metals from the water, this means there is less than 0.1 ppm heavy metal present in a cleaning solution. In order to clean to ppt levels you generally need to do extra rinsing after cleaning with Liquinox detergent. As a general statement, each additional rinse reduces the level of contamination by two orders of magnitude. Therefore, again generally speaking, to get from a cleaning solution of 0.1 ppm heavy metal down to 0.1 ppt, you need to rinse 3 times. Rinsing 3 times is a typical minimum standard rinse for ppt level cleaning. We are aware of labs that use 6 or even 12 time rinses for all their trace analysis work. Certainly, some labs are doing analysis that is even lower than ppt level cleaning. Note that each “time” rinsing means that you fill and empty the article being rinsed once. We would recommend rinsing with a running water rinse of whatever water you used for cleaning to remove gross residues, and then do a thorough 3 time rinse with high purity water. Note that this rinsing procedure is ultimately only as good as your final rinse water. After all, it is the last thing the critical cleaned surface will see. For ppt heavy metal analysis, the best water to use would be very high quality deionized water. After rinsing, ideally you should dry your glassware using a water removing method rather than a water evaporating method. Water removing methods include blowing off the equipment with purified gas, centrifuging off the water, wiping with analytical quality wipes, slow pull drying equipment (robotic equipment that pulls the article very slowly out of ultra high purity water such that the surface tension pulls all the water off the surfaces), or the use of ultra pure drying fluids that dissolve off the water and its impurities. If the water is evaporated on to the surface during drying, then whatever heavy metals are present in the rinse water will be deposited on the surface being dried (water stains). Ultimately to assure the success of your cleaning procedure you will want to do equipment blanks of cleaned glassware. For a validated analytical method, you would run 6 blanks and determine the readings of your various heavy metal analytes and then calculate a standard deviation from the data for each analyte of interest. The limit of quantitation (LOQ) can be estimated as 10 times the mean of the readings divided by the standard deviation. The limit of detection (LOD) can be estimated as 3.3 times the mean of the readings divided by the standard deviation. If your cleaning procedure produces blanks that give you a low enough LOQ and LOD, then your cleaning, rinsing and drying procedure is fine. By careful cleaning with 1% Liquinox detergent, followed by careful rinsing with water of suitable purity, and careful drying, it is certainly possible to get LOQ and LOD values in the ppt range. The better your rinse water, the less careful you have to be with drying.